Tulum was the perfect mix of chilling on those turquoise Caribbean beaches, eating incredible food, exploring Mayan ruins and speaking the Spanish that normally lives somewhere in the deep recesses of my brain and only comes out on special occasions. My husband and I thought about purposely missing our flight so we could eat more shrimp. Having spent a little time in Nayarit and Central Mexico over the years, I really adore this country (maybe a little more than my own at the present moment). There's so much more of Mexico I have yet to explore. D.F. and Oaxaca are next on my wish list, but I would love to return to the Yucatan (often). 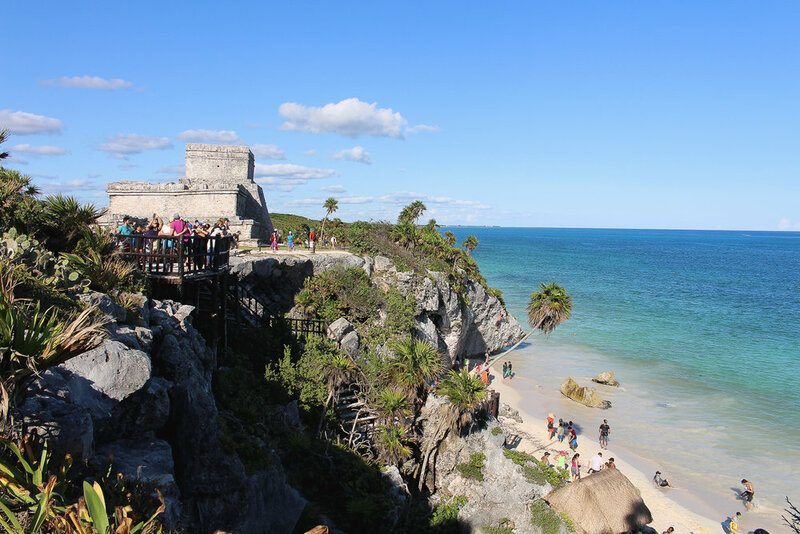 Tulum is a 1.5-hour drive from the Cancun airport (direct flights are easy to find from most major cities in the U.S.). You can either rent a car or take a shuttle or bus, both of which travel all over Quintana Roo. We took a shuttle there (it wound up being just us in the van) and an ADO bus on the way back (like a Greyhound). Rent a bike. A bike is great to get around in Tulum since it's relatively flat. There's a nice bike path/greenway that goes from the beach road into town (I think it's about 5 kilometers), and it's easy to bike to the ruins too. Expect lots of heat and humidity and sun — prepare accordingly with coral-safe sunscreen. Don't eff up the environment while you swim. Bring good bug repellant. Natural bug repellants are a joke with these mosquitos, so deet it is. Check the CDC for current Zika information. 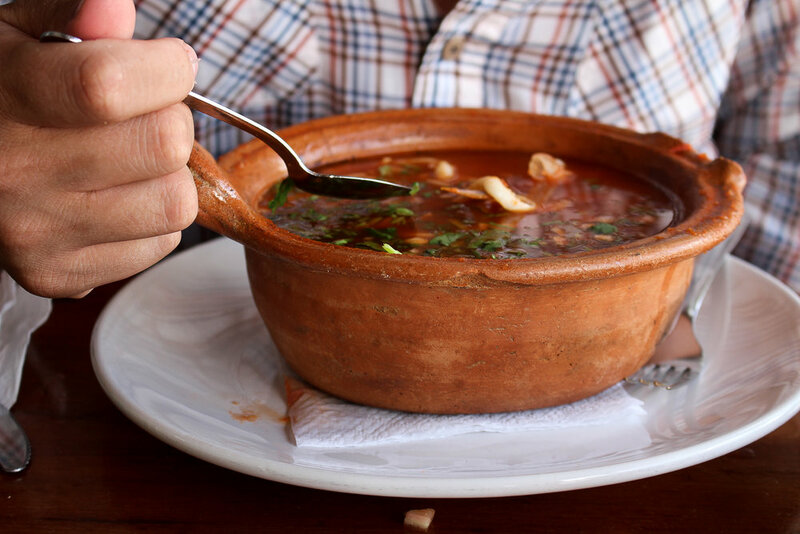 You already know this, but don't drink the tap water or brush your teeth with it in Mexico. Get cash. You'll need cash for almost everything, and you won't find an ATM on every corner so it's best to stay prepared. Learn some basic Spanish and try it out. Universally, it's just good manners to make an effort. To orient you with a bit Tulum geography, you've got the beach (one long road with the beach-side and the jungle-side) and the town a few kilometers to the west. Both are great areas, and you do have to decide where your home base will be. Personally, I want going to the beach to be the easiest part of the day, so that's why I like booking hotels right on the beach. The town is awesome though, so you really can't go wrong (we ate almost all of our meals there so in some ways it might've been more convenient for us!). Wherever you decide, there's absolutely no reason to do an all-inclusive resort kind of thing in Tulum — small boutique hotels and eco-chic guest rooms are available in all price ranges. Even at the high-end places, it's bohemian luxury, so don't expect air conditioning, WiFi or room service. It's more low-key than that. So many hotels in Tulum seem specifically designed for Instagram hashtags, but this one is more down-to-earth and this is where we stayed. It's small, moderately priced and wonderful. It's right on a very private beach (shared with maybe fourteen other people and the occasional dog) next to Azulik, which is like a hipster treehouse. They serve breakfast, and parking and assigned beach chairs are included. Because was on the northern end of the beach, it only took about 15 minutes to bike or short taxi ride to the town center. We would definitely stay there again, though it also might be fun to try some other places because there are so many cute ones. This is where I originally tried to book our stay, but it was full because it was kind of a spur-of-the-moment trip. It's a further south down the beach road (so less convenient to get into town). I haven't stayed there so I don't know if it's as awesome as it seems, but it looks so beautiful! This hotel is right on the edge of town also looks wonderful—straight out of a design magazine. I haven't been there myself but some friends have and loved it. There are some really snazzy Airbnbs to rent in Tulum, which would be a great way to go if you have a larger group or are traveling with kids. There aren't many of them along the beach, but there are a few in town. Some of them have private pools, some of them have air conditioning. My husband and I are planning to take winter break trip to Tulum with a friend-couple in 2019 (we'll both be bringing our babies! ), so I might have some more specific Airbnb tips for ya after that since we might go this route. P.S. If you book through my referral link, you get $20 off your first stay anywhere. Score. This place is not a secret. Alas, nothing in Tulum really is. But the coffee is excellent and the courtyard is lovely. They even have a couple of guest rooms if you want to stay in town. There are a lot of little touristy shops along the main drag in town surrounding Ki'bok. Most of the shops sell relatively the same things, but I did really enjoy some of the painted jaguar heads because it seemed like someone had actually painted them by hand. Tulum's Mayan ruins are a must. I feel like I don't even need to put them in here (because of course you will do this). Bring your swimsuit and a picnic (and plenty of water) to hang out at the beach all day. Or just take an hour or two to roam the grounds with the iguanas and enjoy the ridiculously beautiful views. Town is where it's at when it comes to authentic, inexpensive and just plain amazing Mexican food. It's been a year and I still think about all these meals way too often. Oh my, oh my, oh my. You must eat here, without exception. 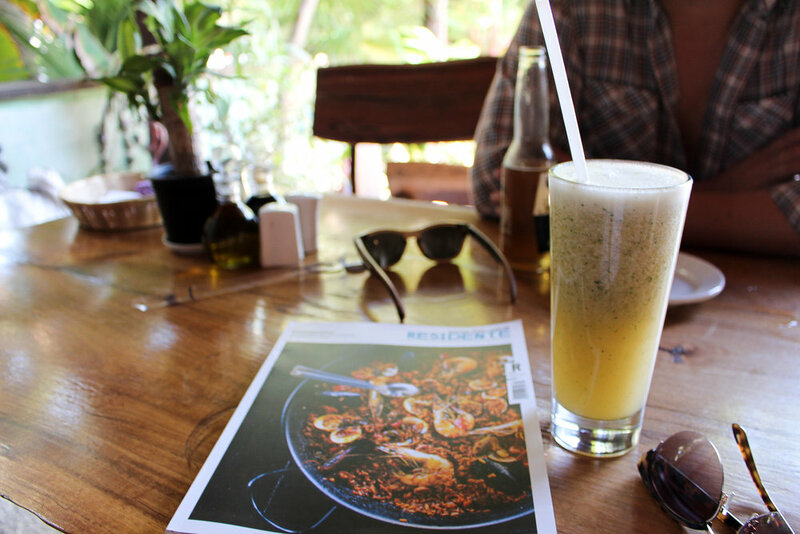 It was the best seafood we ate in Tulum. I have high hopes of recreating the shrimp tacos a la pirata someday because I loved them so much. It was grilled shrimp with some secret sauces and a spinach-cabbage slaw — perfection. Definitely order those tacos and any kind of ceviche they happen to have. The portions will be enormous, as a warning. My husband and I ordered two kinds of ceviche and one order of tacos to share and we couldn't finish everything... and we/he almost never leaves food on the table. There are a ton of taco shops in Tulum (and we ate at a couple others too), but this was my favorite. It's incredibly busy all the time, with both locals and tourists, so there was a short wait for a table but everything happens quickly. It's cheap (like 7 pesos per taco!?!) and the al pastor alone is worth the plane ticket. They only have three kinds of meat (al pastor, pollo and carne asada) and then you pick your meat vehicle. In addition to the standard tacos, they have tortas (sandwiches), sopes (masa cake), salbutes (deep-fried puffy masa cakes), and panuchos (a refried bean-stuffed salbute). No seafood here, but they do have one vegetarian option should you need it. Once you get your food, you go up to the extensive bar of salsas and fixings to dress everything up. Beware that some of the sauces are very spicy. Taste them before you drench your plate. Guarapo is cane juice, in case you are wondering. They have that kind of drink in Asia too, and it's obviously delicious because it's fresh-pressed sugar cane mixed with water, lime juice and sometimes herbs. Anyway, Batey was a really busy indoor-outdoor bar with great live music and all sorts of refreshing beverages. We also checked out a lounge/bar called Todos Santos, but I think that may be closed now. Despite the fact that it's a little bit outside of the town center, this seems to be one of the more popular seafood spots — and for good reason. El Camello was founded by a small fisherman's co-op, so freshness is a given. We really liked the seafood soup, ceviche (literally ordered ceviche everywhere we went) and camarones a la diabla. Next time, I'd do the whole fish. The beach/jungle road of Tulum is a scene — a luxury bohemian (and touristy) sort of scene that's as expensive and hipster as Brooklyn. During the high season, it can be impossible to get tables (I learned this the hard way). As I mentioned, the food in town was so amazing that we didn't have time to try either of these restaurants. Next time though, we've got the following places on our list. Hartwood is like the restaurant in Tulum, run by a guy from New York who cooks using local methods and local ingredients. Normally I'd be miffed by this sort of cultural appropriation, but in this case it seems to come with a good deal of respect for the local community and apparently the food is incredible. All our friends said we should go, so we did try. Their reservation system is useless during the high season unless you make one online a month in advance or are willing to wait in line in the middle of the afternoon to get on the list for dinner that night. By the time we arrived, the list was already full that night. I did snap a picture from the line so it's almost like we ate there... wait, no it's not. Gitano is mezcal bar and modern Mexican restaurant that I also want to try next time (again, if we can actually get a table). Whole fish and ancho chili and coffee-rubbed brisket? Yes, please. I also really like that they have a drink on their menu that's just prosecco with one ice cube. It makes me feel like they get me. Cenotes are freshwater sinkholes. That sounds kind a gross out of context, but they are gorgeous! The water is as clear and blue as the Caribbean. There's a whole system of cenotes in the Yucatan, many of them connected. In addition to snorkeling, you can also scuba dive in the cenotes and check out all the underwater caves, but that is my Actual Nightmare. In case you aren't aware of my position on snorkeling and other underwater activities, here's the deal: I get mildly anxious when I'm fully submerged in water, especially oceans. Mostly because of the suffocating nature of being underwater, but also because there are too many creatures who I respect too much to be a disruptive alien poking around in their world like I own the place. However, on this trip to Mexico I pushed myself to try snorkeling again and I'm glad I did. Granted, by "pushed myself," I mean that one day I went snorkeling in the ocean for several minutes in front of our hotel and then another day I snorkeled in a cenote for about 15-17 minutes. It was extremely deep water, and I swam from one cavern to another in almost complete darkness! WATCH OUT, WORLD. Gran Cenote is stunning. I can only imagine what some of the lesser-known cenotes are like without any other people around. This felt like another world even with people around. This cenote is fairly close to town and we thought about biking there until we realized we'd be biking back in our wet clothes in 100 degree weather. Yeesh. Anyway, we took a taxi. They have lockers and changing rooms on-site. Remember to shower off before you go in, because most sunscreen and bug repellants are banned from the cenotes to protect the fragile ecosystem. If you want to try a different cenote, there are many within easy driving distance from Tulum: Cenotes Labnaha, Cenote Zacil-Ha, Cenote Calavera, Cenote Naharon, I could go on forever. There are so many. Wandering aimlessly was one of the best parts of this trip (any trip, really! ), in part because we would come across the most interesting murals and street art around every corner. 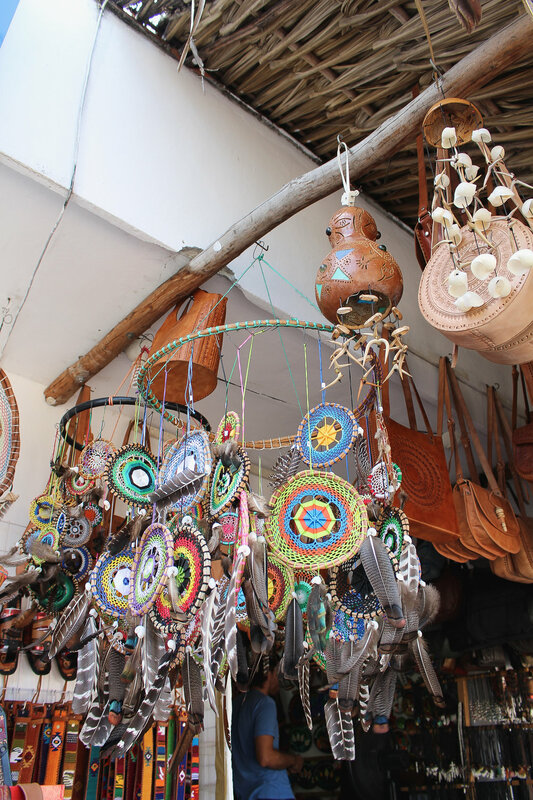 Tulum is like a bohemian fashion show, so it's casual but very stylish. That said, it doesn't mean you have to overthink it. As with most trips, I wound up wearing the same couple of things over and over. I packed very light for a whole week — I even used my smallest carry-on. This what I brought for an early January trip (the affiliate links go to the stuff I actually packed or similar styles I really like), but obviously... YOU DO YOU. In summary (if you couldn't gather from this novella of a travel guide), I'm obsessed with Tulum. If you're headed there, pack me in your suitcase and let me share your ceviche. I'll bring the snorkel gear.